Fulfilling requirements for maintaining the status as a professor. In order to receive ethical clearance. Falling the requirements for receiving a Master's or Ph.D. In order to receive grants that will allow you to carry out the research. When an organization offers funds for a research project, they want to know what the project is about and ultimately decide whether it is worth providing money for. These committee boards often live busy lives and have to look through a lot of proposals, which means they don't have a whole lot of time to devote to them. This is why they need to be brief, show a great deal of competence, and demonstrate that your project is feasible and relevant. In particular, you have to think of a synopsis as an opportunity to sell your ideas and receive approval to go forward with your research. It goes without saying that a synopsis or protocol makes a significant difference. In fact, if your synopsis is written without much thought or if you rush to try to complete it, it is extremely unlikely that the committee or organization will be impressed. Thus is important to understand how to write this type of paper in a way that shows you are serious about the research project and will devote all the time and energy required to make it successful. What is research project synopsis writing? Let us take a look at what protocol means as well as synopsis' meaning in a literal way. Protocol (which is derived from Greek, meaning first page) is defined as a complete and organized manner for carrying out a research project. Synopsis ("syn" meaning "together" and "opsis" meaning "seeing) means a brief summary. Both words can be used interchangeably, although synopsis is more common. Below we will discuss in detail the synopsis format and project synopsis. 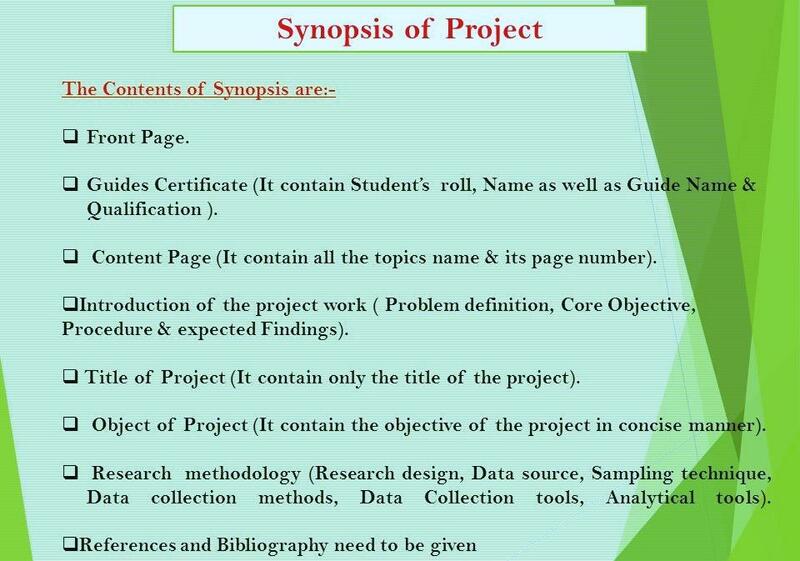 Let us look at a more in-depth explanation of what a synopsis for projects involves. The title for research synopsis writing needs to be short, but still provides information about the research topic. You would want to take an academic approach to this, mean means avoiding titles that include slang or seem sensationalized. You can include the hypothesis in the title if you wish, but avoid discussing other details in the title itself. For the synopsis of a project, you would want to discuss the problem or hypothesis in a brief but clear manner. When you have a thorough understanding about the problem, it makes it easier for you to build the research proposal around it. Of course, it also makes it easier for you to develop a hypothesis or hypotheses. It is important that the problem be relevant and current. You can also discuss how finding a solution to this problem with lead to measurable positive outcomes. You would also want to discuss your personal motivations for carrying out this project as well as an explanation for why the reader should find it to be a worthy project. The hypothesis is defined as a prediction or explanation detailing the relationship between two or more variables. Note that the hypothesis should be based on solid reasoning and firm knowledge about the topic. In other words, it is not merely a random guess that was created just to fulfil the need for proposing a hypothesis. It also should not be something subjective nor should it be something that has either been thoroughly explained or is so obvious that it is not worthy of testing. You can base your hypothesis on the knowledge that you have gained during the course of your studies, or from having done a compressive literature review that would indicate that your hypothesis could have some validity. Keep this under 200 words. Every research proposal should contain purpose. The aims and objectives lays its purpose out carefully. When thoroughly defined, it demonstrates to the committee judging your research project proposal that you have really given the project a lot of thought. It provides background and context related to the problem under study. It briefly discusses similar work done by other researchers. It identifies gaps in the research, which is essential as it provides strong justification for carrying out your proposal. It discusses weaknesses of other research and explains how they can be corrected. This can go a long way towards making your project more feasible since you have a plan to improve upon previous research ideas. The literature review makes it possible to structure or modify the methodology based on the information you have uncovered. The literature review allows you to identify important variables and conceptualize their relationship. The literature view does not have to be comprehensive. In fact, if the project is accepted, you will most likely need to add more literature view works. It is generally recommended that the review consist of around 300 words. You should use reputable sources that others can easily retrieve. In particular, you should focus on scholarly journals and academic research that has been peer-reviewed and can be found on JSTOR and other databases. Do not include any academic work that is only tangentially related since you really want to focus on topics that are applicable to your research. Do you know how to write a methodology for a project report? Here are some types. When discussing the methods, you should explain both why they are best for your study as well as other methods that would either make little sense, would be impractical or are prohibitively expensive. Plans for working with other organizations. Data analysis will be extremely important when you begin writing your full-fledged dissertation. While you most likely won't include it in your synopsis (since you won't have collected any data yet), you should nonetheless create a plan for collecting and assessing data, such as by using statistical methods, various software, and different methods of sorting data. Avoid making vague and generic statements such as, "This project will use the best statistical methods possible." If you are conducting experiments on humans or animals, you need to make sure you have the right certificates from the various government agencies. Attach this to your synopsis. Whenever you use outside sources - particularly in the literature review - it needs to be properly cited. There are several formatting styles to choose from (i.e., MLA, APA, Harvard and Chicago), but you should find out whether your professor has a preference before you pick one. As with every paper, make sure to take some time to edit, proofread or revise your research project synopsis. A typo or a poorly written sentence can make a big difference and could even lead to your proposal being rejected!